UNAMID troops in East Darfur. Expressing deep concern at the “serious deterioration” in the security situation in Darfur, the Security Council has decided today to extend for one year, until 30 June 2016, the mandate of the African Union-United Nations Hybrid Operation in the Western region of Sudan. The mission, known by the acronym UNAMID, will consist of 15,845 military personnel, 1,583 police personnel and 13 formed police units of up to 140 personnel each, says a resolution adopted unanimously this morning by the 15-member Council. “In the context of the lack of progress on the benchmarks,” the Security Council, by the resolution, reiterates its endorsement of UNAMID's revised strategic priorities: civilian protection, facilitating delivery of humanitarian assistance and safety and security of humanitarian personnel; as well as mediation between the Sudanese Government and non-signatory armed movements on the basis of Doha Document for Peace in Darfur, and support to the mediation of community conflict. While welcoming progress made in implementation of some elements of the Doha Document, including the completion of some security arrangements, the Council deplores “continuing serious delays” in overall implementation of the accord. The Council therefore demands that all parties to the conflict in Darfur, including in particular the non-signatory armed groups, and other groups to immediately cease all acts of violence, and commit themselves to a sustained and permanent ceasefire. The resolution adopted today also calls for an urgent end to inter-tribal clashes, criminality and banditry that affect civilians, and requests UNAMID to continue to support local conflict resolution mechanisms. In the face of increased human rights violations and abuses in Darfur, the Council calls on the Government of Sudan to investigate and bring those responsible to justice, while emphasizing the importance of ensuring UNAMID's and other relevant organizations' ability to monitor such cases. Meanwhile today, UNAMID issued a statement in which it expressed concerns about “recent media reports” that it has deliberately delayed assisting the Sudan Disarmament, Demobilisation and Reintegration Commission (SDDRC). “UNAMID's role in the ongoing disarmament, demobilisation, and reintegration process in Darfur is guided by the provisions set out in the [Doha Document], which provides for UNAMID supporting the SDDRC in its endeavour to disarm and demobilise former combatants from Liberation and Justice Movement (LJM) and Justice and Equality Movement (JEM-Sudan/Dabajo),” said the statement. The Commission has requested UNAMID to extend its cooperation to the demobilisation of troops from the Sudanese Armed Forces (SAF), the Popular Defence Forces (PDF) as well as those earmarked by the 2006 Abuja Agreement. While the Mission declined, on the grounds that this is demilitarization as opposed to a DDR exercise, UNAMID has nevertheless agreed to help with the ex-combatants identified by the Abuja Agreement provided that the Commission presents a “complete master list of potential combatants” to be demobilised. “However, up to the present time, the Mission has not received this list and hence the delay in processing Abuja Agreement caseloads,” the press releases explains. Despite such operational hurdles, UNAMID has managed to successfully complete the demobilisation of 534 ex-combatants in 2014 and is currently working with the Commission to demobilise the LJM caseload. 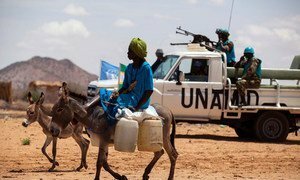 The security situation in Darfur is a very serious one, marked by a “deeply concerning” increase in violent attacks by armed assailants against United Nations peacekeepers and humanitarian personnel, the Assistant Secretary-General for UN peacekeeping operations told the Security Council today.